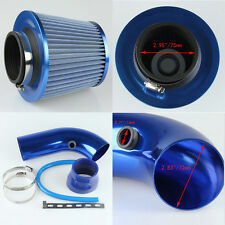 Cold Air Intake Pipe Set Blu e. 1 x 45 Degree Carbon Fiber Look Steel Cold Air Intake Pipe. It's the filtration performance Cold Air intake Kit. 1 X Air Intake Filter. 1.0403 Blue AIR FILTER INCLUDED! 1 x Car Cold Air Intake Pipe. Made for universal car. Install easily and economical. This item have 3 months warranty. 1 x mounting bracket. 1 x tiub hose. 1 x silicon joiners. Adopt excellent the aluminum alloy material. 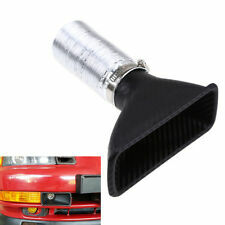 Universal Car Front Bumper Turbo Air Intake Pipe Turbine Inlet Pipe Air Funnel Kit. Funnel Size: 168 x 63 x 106mm/6.61" x 2.48" x 4.17". 1 x Car Front Bumper Turbo Air Intake Pipe Kit. Increasing of cold air flowing to air filter can instantly be felt, especially increasing the oxygen for the combustion process. 1 x 45 Degree Cold Air Intake Pipe. Universal Cold Air Intake are designed and manufactured for a wide variety of applications. Made for universal car. Install easily and economical. 1 X 75mm air filter. Universal Car Front Bumper Turbo Air Intake Pipe Turbine Inlet Pipe Air Funnel Kit. 1 x Car Front Bumper Turbo Air Intake Pipe Kit. Increasing of cold air flowing to air filter can instantly be felt, especially increasing the oxygen for the combustion process. 1 X 75mm air filter. 1 x 45 Degree Cold Air Intake Pipe. 1 x Tube hose. Universal Cold Air Intake are designed and manufactured for a wide variety of applications. Fuel efficient and increase power. 1 x Aluminum Air Intake Pipe. Universal fit for most vehicles. Color: Silver. This item have 3 months warranty. 1 x mounting braket. 1 x Silicone Vacuum Hose. 1 x silicon joiners. Has enough space to install. 1 x Car Cold Air Intake Pipe. It's the filtration performance Cold Air intake Kit. CARBON FIBER AIR FILTER INCLUDED! High quality built Washable and Reusable Air Filter as shown in the picture. Material: Aluminum. 1 x Car Cold Air Intake Pipe. It's the filtration performance Cold Air intake Kit. CARBON FIBER AIR FILTER INCLUDED! High quality built Washable and Reusable Air Filter as shown in the picture. What is included with this Item?. 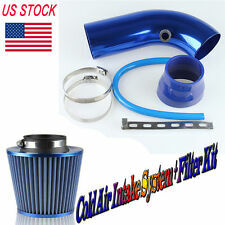 Cold Air Intake Pipe Set Blu e. 1 x 45 Degree Carbon Fiber Look Steel Cold Air Intake Pipe. It's the filtration performance Cold Air intake Kit. 1.0403 Blue AIR FILTER INCLUDED! High quality built Washable and Reusable Air Filter as shown in the picture. 1 x Car Cold Air Intake Pipe. It's the filtration performance Cold Air intake Kit. Blue AIR FILTER INCLUDED! High quality built Washable and Reusable Air Filter as shown in the picture. Material: Aluminum. Fit for 2014-2017 BMW 2-Series F46 Gran Tourer Pre-facelift. Fit for 2014-2017 BMW 2-Series F45 Active Tourer Pre-facelift. 1 Pair of Car Front Grille (left & right). Fit for Part Number (Left): 51137379609, 51137379611, 51137300543. 1 x Car Cold Air Intake Pipe. It's the filtration performance Cold Air intake Kit. What is included with this Item?. Blue AIR FILTER INCLUDED! High quality built Washable and Reusable Air Filter as shown in the picture. 1 x Car Cold Air Intake Pipe. 1 x tiub hose. Made for universal car. Install easily and economical. 1 x silicon joiners. Adopt excellent the aluminum alloy material. 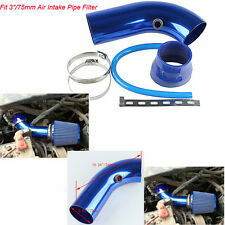 Universal Car Front Bumper Turbo Air Intake Pipe Turbine Inlet Pipe Air Funnel Kit. Funnel Size: 168 x 63 x 106mm/6.61" x 2.48" x 4.17". 1 x Car Front Bumper Turbo Air Intake Pipe Kit. Universal fit for most cars. The air intake pipe made of excellent aluminum alloy material, high temperature resistant and anti-corrosion, ultra durable. Funnel-shaped air intake hose designed to direct cold air inward, minish intake turbulence, boost air speed and generate. The air intake pipe made of excellent aluminum alloy material, high temperature resistant and anti-corrosion, ultra durable. This air intake hose is designed for horsepower increase, which can also protect your engine from harmful debris. This air intake hose is designed for horsepower increase, which can also protect your engine from harmful debris. Funnel-shaped air intake hose designed to direct cold air inward, minish intake turbulence, boost air speed and generate. 1 X 75mm air filter. 1 x 45 Degree Carbon Fiber Look Steel Cold Air Intake Pipe. Universal Cold Air Intake are designed and manufactured for a wide variety of applications. Adopt excellent the aluminum alloy material. 1 x Car Cold Air Intake Pipe. 1 x tiub hose. It's the filtration performance Cold Air intake Kit. What is included with this Item?. Blue AIR FILTER INCLUDED! High quality built Washable and Reusable Air Filter as shown in the picture. 1 x Car Cold Air Intake Pipe. It's the filtration performance Cold Air intake Kit. CARBON FIBER AIR FILTER INCLUDED! 1 x tiub hose. High quality built Washable and Reusable Air Filter as shown in the picture. 1 x Car Cold Air Intake Pipe. It's the filtration performance Cold Air intake Kit. 1 x tiub hose. CARBON FIBER AIR FILTER INCLUDED! High quality built Washable and Reusable Air Filter as shown in the picture. 1 x Car Cold Air Intake Pipe. It's the filtration performance Cold Air intake Kit. Material: Aluminum. What is included with this Item?. Blue AIR FILTER INCLUDED! High quality built Washable and Reusable Air Filter as shown in the picture. 1 x 45 Degree Cold Air Intake Pipe. Universal Cold Air Intake are designed and manufactured for a wide variety of applications. Adopt excellent the aluminum alloy material. 1 X 75mm air filter. Material: Aluminum & Cotton Gauze. Fit for 2014-2017 BMW 2-Series F46 Gran Tourer Pre-facelift. Fit for 2014-2017 BMW 2-Series F45 Active Tourer Pre-facelift. 1 Pair of Car Front Grille (left & right). Color: Matte Black. Improve your car's exterior styling, bring a new look. 1 x 45 Degree Cold Air Intake Pipe. Universal Cold Air Intake are designed and manufactured for a wide variety of applications. 1 X 75mm air filter. Help to draw more air into your engine so as to improve throttle response and enhance horsepower. Notice: The vent only for decoration but not real air vent. This fast and easy decoration makes your vehicle stand out from others. Decoration Side air vent x 2. This item give your car a classy and customized look. 1 x 45 Degree Cold Air Intake Pipe. Universal Cold Air Intake are designed and manufactured for a wide variety of applications. 1 X 75mm air filter. Color: Blue. Help to draw more air into your engine so as to improve throttle response and enhance horsepower. Universal Car Front Bumper Turbo Air Intake Pipe Turbine Inlet Pipe Air Funnel Kit. 1 x Car Front Bumper Turbo Air Intake Pipe Kit. Universal fit for most cars. Increasing of cold air flowing to air filter can instantly be felt, especially increasing the oxygen for the combustion process. Fit for 2014-2017 BMW 2-Series F46 Gran Tourer Pre-facelift. Fit for 2014-2017 BMW 2-Series F45 Active Tourer Pre-facelift. Color: Matte Black. 1 Pair of Car Front Grille (left & right). Fit for Part Number (Left): 51137379609, 51137379611, 51137300543. Fit for Part Number (Left): 51137379609, 51137379611, 51137300543. Fit for Part Number ( Right) : 51137379610, 51137379612, 51137300544. Fit for 2014-2017 BMW 2-Series F46 Gran Tourer Pre-facelift. Fit for 2014-2017 BMW 2-Series F45 Active Tourer Pre-facelift. 1 x Car Cold Air Intake Pipe. It's the filtration performance Cold Air intake Kit. High quality built Washable and Reusable Air Filter as shown in the picture. CARBON FIBER AIR FILTER INCLUDED! What is included with this Item?. Notice: The vent only for decoration but not real air vent. Decoration Side air vent x 2. This fast and easy decoration makes your vehicle stand out from others. - If permitted, heat it with heat gun, you can affix our product to anywhere as you like ( bumper, engine cover, roof, car body).